I'm not a terribly crafty girl. But I struggle in areas of design, decor and generally being able to put colors and pattern together in a publicly acceptable way. So I enjoy any ideas that are intended to inspire, to motivate, to tickle the creative. One campaign I love is the Pantone's Color of the Year. The creative and savvy people of Pantone essentially choose a color to shine each year. By chosen color is meant to invigorate the senses and draw out great style. I enjoy that every design, decor, fashion and DIY resources creates project ideas and tips around the Pantone Color. I use these tidbits to get in tune with my own fashion and decor! 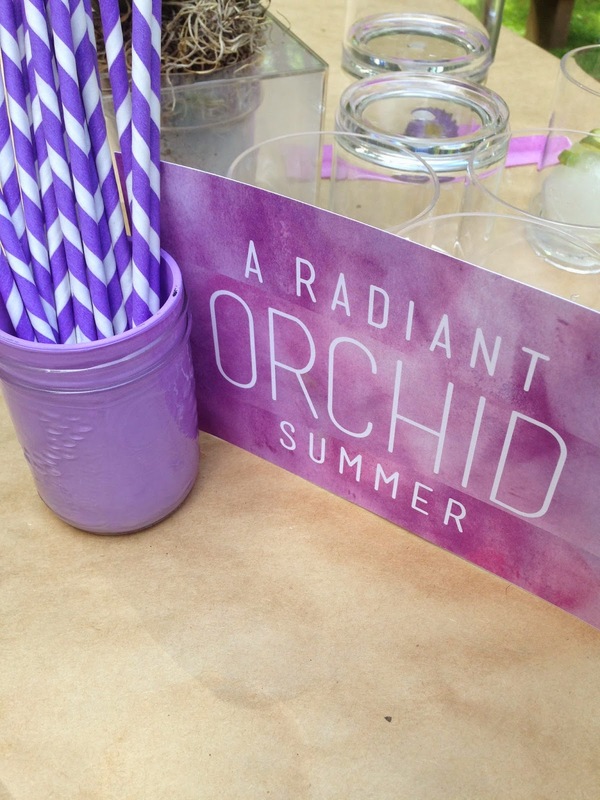 Kim of Design + Life + Kids hosted a fantastic Radiant Orchid garden party. The focus, of course, was the beautiful hue of orchid, which we incorporated into fun crafts, delectable food, fabulous decor and awesome entertaining ideas! 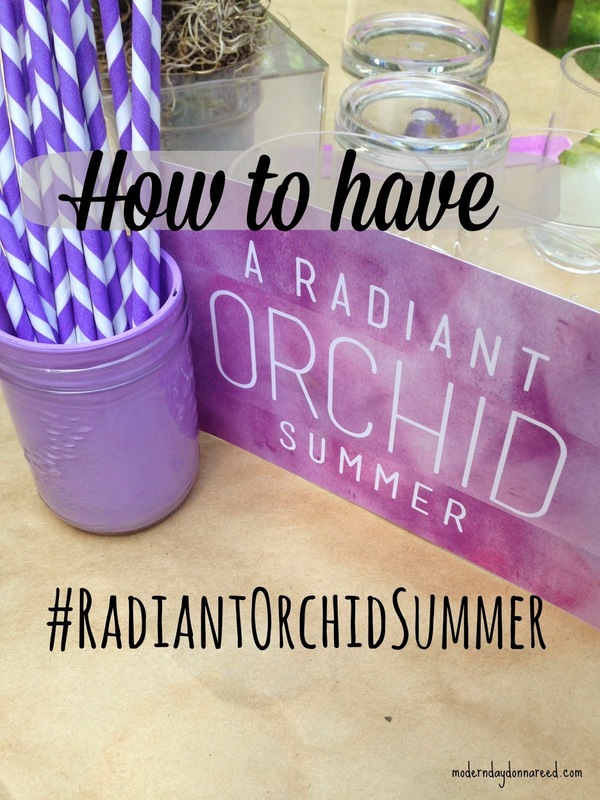 So how does one have a Radiant Orchid Summer? I had a great time crafting, eating and getting to know great brands with some of my favorite bloggers, including Kim, Heather of Diapered Daze and Knights and Lindsey of Sisters to Sons. Me and my blog gals: Kim, Lindsey and Heather. We meandered around the various stations where there was inspiration from Minted prints (one of which I won and got to take home!) and DIY Quirk Books. This is the print I won from Minted. I LOVE IT. 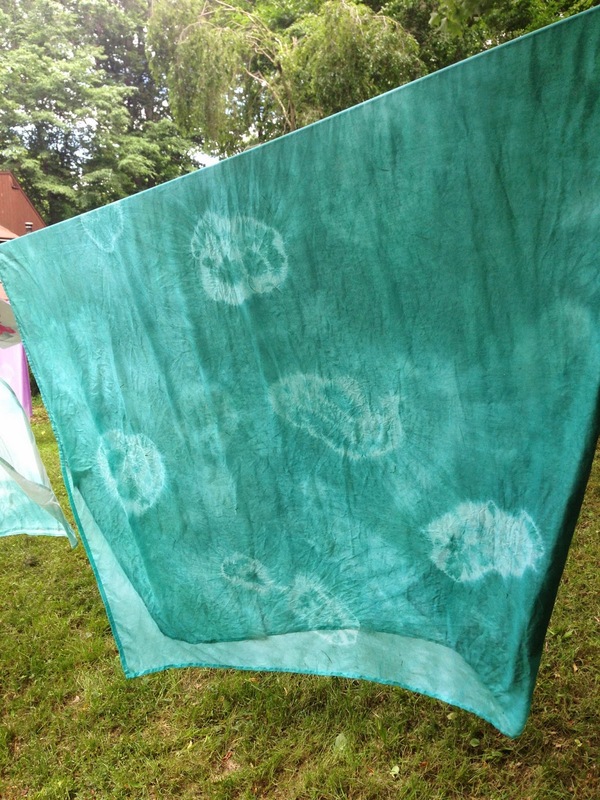 …and dyeing fabric with Rit Dye. It was SO FUN designing and dyeing our own picnic blankets. I went with a teal, which turned out gorgeous. It was surprisingly more simple than I thought it would be, and I'm excited to try some dye projects with the kids this Summer. Check out my girls being all awesome and creative and whatnot. Check out my crafty masterpiece! Kim's house is an amazing homage to design, as Kim and her husband are pretty fantastically creative people. 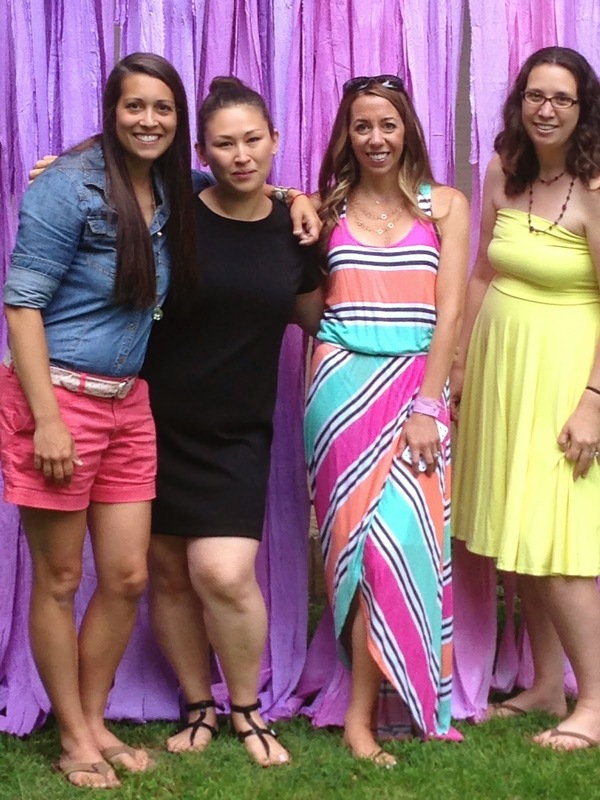 Her backyard was set up so beautifully, and it was easy to enjoy the party while relaxing. Especially in the Hammock Swing she had set up from La Siesta. After drawing out the minuscule amount of creative juices I own, I had worked up a decent appetite. The food. ZOMG. So many fun appetizers. And the drinks? Awesome! I love sampling a brew from new local craft brewers Brandywine Valley Brewing Collective. They made a radiant orchid-themed beer just for the event! We also made adult slushies with Zoku Slush Maker Mugs. After pouring watermelon-ade (is that a word?) to the freezer chamber, we stirred around the liquid while we chatted. After about 2 minutes, we had a slushy! Which we immediately doused with vodka! 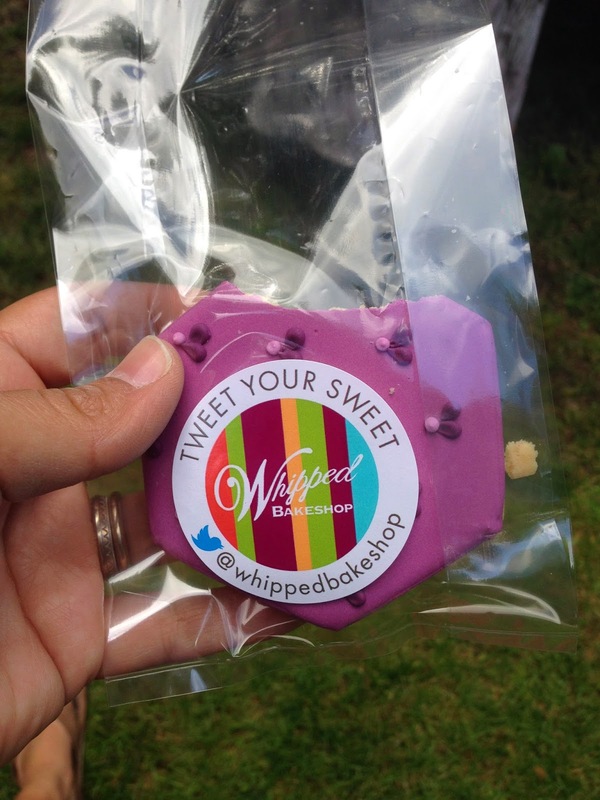 One of my favorite visual pieces of the party were the radiant orchid geometric cookies from Whipped Bake Shop in Philly. Not only were they GORG but they were DELISH as well. I left the party with a great gift basket from Casabella (a company who might actually make me enjoy cleaning! ), filled with goodies, including the slush maker mug from Zoku, more Rit Dye for future crafting, fun Quirk Books about DIY marshmallows and pom poms, a super cute necklace from Panache Box, and TAPI from Dreamfarm that turns a regular faucet into a water fountain (HECK YES). A special thanks to party sponsor, Bing, for making it all happen! Thank you, Kim: I am now ready to make my summer a Radiant Orchid Summer!